Years ago, famous composers Rogers and Hammerstein introduced the highly successful Broadway play entitled “Oklahoma”. It was a smash hit and initially ran for in excess of 2200 performances. One of the characters was a rather free-spirited girl who sang a song whose main line was… “I’m just a girl who caint say no”. 1. Saying NO to going to bed on time. Solution: Ironically, the best way to force yourself to go to bed on time is to force yourself to get up on time. If you are supposed to get up at 6 AM and you don’t go to bed until midnight, it’s probably difficult to get up at 6 o’clock. There is an easy solution. Put the alarm clock across the room so you have to get up to turn it off. You might be tired the first day but this is a gift – your fatigue will force you to go to bed earlier that night. Do this three days in a row and you will automatically adjust your “sleep cycle”. This then gives you the required hours of sleep you need. NO Excuses. 2. Saying NO to unqualified prospects. Solution: The only reason we work with poor leads/prospects is because we don’t have any better ones to replace them. It’s hard to say NO to one of those “time vampires” when that’s all you have on your leads list. The solution is simple – set aside 2 hours every single morning to prospect for good leads. This is the front end of your “conveyor belt”. It’s the opposite of “garbage in – garbage out”. By prospecting consistently every morning you will be able to eliminate the need to work with weak Buyers and Sellers. Simply put – a hot lead makes it easy to say NO. NO Excuses. 3. Saying NO to all the drama around you (business and personal). · Have a Dream Board with pictures of the things you are working towards. IE: Your personal goals. Post it in your office to keep reminding you of what’s really important in your life. 4. Saying NO to daily distractions. Solution: This is a big one! Every day when you start work write down the top 3 Priorities that you must accomplish that day “no matter what”. This is your NO Excuses “to do list” for today. Check them off as the day goes on with the proviso that you don’t stop work until the big three are done. By staying focused on your top 3 for the day you will ensure that each day is productive. NO Excuses. 5. Saying NO to taking time off. Solution: This is one of those “less is more” scenarios. There is a big risk of overworking when you are a full-time real estate Salesperson. You can’t afford to get burned out. There is a truism that says… “If you don’t give your mind time to relax, your body will do it for you”. The key is to build some balance into your life. The best way to do that is to actually schedule a minimum of 1 – 1 1/2days off per week. Remember – if you don’t schedule this time, you will always come up with an excuse as to why “I can’t take time off today”. Put it into your schedule in advance and be your word – it’s healthy and it will give you something to look forward to. NO Excuses. There are the first five Saying NO’s for you to look at. 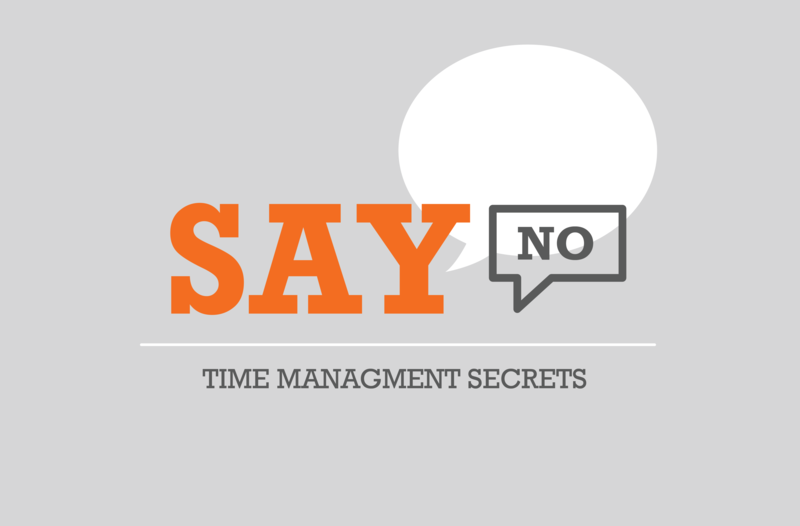 Is there anything else on your list that you should be saying NO to? Do some self-discovery and make your life easier. Warren Buffett has a great quote… “The secret to my success is in my ability to say no to the unimportant things so I can say YES to the things that really count”. NO Excuses.